Here are some of the links I frequently use and hopefully some of them will be of some use for you as well. Seegmiller Art The Art of Don Seegmiller. Fred Gambino Online gallery of Fred Gambino . Oyonale Graphical experiments of Gilles Tran . Enrico Valenza Online portfolio of Enrico Valenza . AnimWatch Showcasing the Best in Independent Animation. Drawthrough This new site contains some of Scott Roberton's personal and professional work done over the last 16 years working as a teacher and industrial designer. JHT's Planetary Pixel Emporium You will find on this site planetary texture maps that you can use in just about any 3D rendering program to create images of the planets of our solar system. PieroTonin.com Piero Tonin is a full time illustrator, animator and cartoonist based in Milan, Italy. Feng Zhu Design Feng Zhu Design has provided concept design services to many of the top studios in the entertainment industry. Drawn! Drawn! 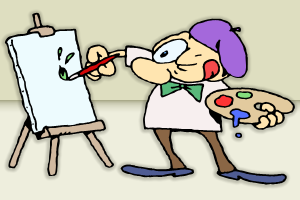 site is a multi-author blog devoted to illustration, art, cartooning and drawing. Its purpose is to inspire creativity by sharing links and resources. Redsketch Doodles Red & Straight-Ahead. Outcast Studios Outcast Studios Comic Creators Resource Site. Jet Arts Online gallery of Dmitry Popov. Keith Parkinson Online fantasy gallery of late Keith Parkinson . Furiae Gallery of digital artist Linda Bergkvist. Krista Huot Online gallery of Krista Huot. Firefox The award-winning Web browser is now faster, more secure, and fully customizable to your online life. With Firefox 2, we’ve added powerful new features that make your online experience even better. Thunderbird Mozilla’s Thunderbird 2 email application is more powerful than ever. It’s now even easier to organize, secure and customize your mail. Wings 3D Wings 3D is a subdivision modeler inspired by Nendo and Mirai from Izware. Opera Opera gives you the tools to experience the Web your way.